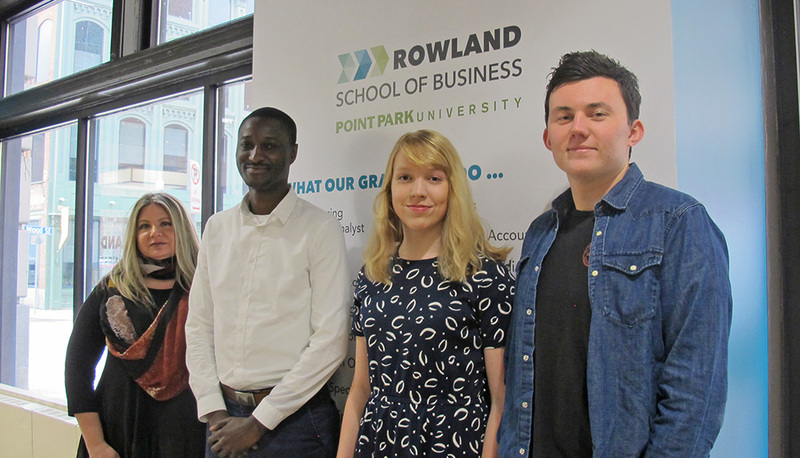 Point Park University students Tanner Campbell, Alexa Lake, Edwin Obuya and Sabrina Tatalias recently finished second in the national GfK NextGen Hackathon Competition to design a hypothetical, artificial intelligence-based smart home speaker generating the most profit. GfK, short for the company’s tagline “Growth From Knowledge,” is a global market research company focused on data science integration and consumer insights. The company challenged students to develop strategic recommendations, based on data sets, for a smart home speaker just entering the market. “Market research is always tricky because if you use historical data, that may not be a good picture of what’s going to happen in the future because trends tend to change,” said Mark Voortman, Ph.D., in a recent interview with The Globe. Voortman is assistant professor and director of the information technology program, and the team’s faculty advisor. Teams had 10 days to mine raw data sets for relevant insights, convert them into business guidance and then remotely present findings and field questions from a panel of judges, which included GfK clients from leading brands acting as mentors to the students and GfK’s own data science experts. The teams were then assessed on a variety of criteria, focusing both on data skills and business intelligence. “GfK gave us access to lots of their own proprietary data for this — just one spreadsheet contained over 6,000 rows of product information. With so much data, we decided to implement an artificial intelligence which was trained to predict the revenue for a product based off its attributes. Then, we tested thousands of combinations to determine which features our product would include,” explained Lake, a freshman funeral service major and member of the pre-medical and health-related professions program, from Midlands Middle College in West Columbia, S.C.
Campbell, a senior information technology major from Governor Mifflin High School in Reading, Pa., said: “I enjoyed working with the large data set and trying to figure out the best option. Based on our results, we found a 150-millimeter by 150-millimeter speaker with Google voice integration selling for $380 to be the most profitable speaker to sell on the market." “This was a great opportunity to learn new technology and work on a student team. I’m glad Dr. Voortman suggested I participate," Obuya, a senior IT major, added. Obuya is an international student and graduate of Moi Forces Academy in Nairobi, Kenya. “Point Park placing second was exciting news, especially since it was our first time in this competition. Also, it comes at a great time since we’re preparing for a Data Jam competition on campus, which is also analytics focused,” said Dorene Ciletti, Ph.D., associate professor of sales and marketing. Even though she is not an IT major, Lake enjoyed the opportunity to participate in the data analytics competition.